An oven is a must-have tool for the food connoisseur. Baking is an important technique for cooking internationally. Every cuisine has its share of baked delicacies, ranging from cakes and pies like the famous Apple Pie to rice dishes, pizzas and pasta. Just the aroma of cake baking in the oven is enough to perk up the mood of each person in the house and to tickle the curiosity of the neighbors too. If you master basic cakes like the Rich Vanilla Sponge Cake or the Eggless Chocolate Cake Using Curds, we are sure you can transform them to produce desserts for occasions ranging from a simple family meal to a stellar birthday cake. Most cakes found in the market have eggs, we have come up with a collection of 53 eggless cakes recipes. You can use substitutes like curd, oil, condensed milk and create a wide range of oven recipes cakes like the Eggless Marble Cake, Eggless Semolina and Coconut Cake or a beautiful Date and Walnut Cake. Most cakes make use of plain flour and milk, we have come up with vegan and lactose–free versions of cake recipes too. Bake delicious carrot cake with whole wheat flour and pack them in your kid’s tiffin box to surprise them at school. Also, the Vegan Chocolate Cake is rich and moist with just the right proportions of ingredients. The oven has also proved its mettle as a valuable tool for health conscious people, as it helps to make healthier, baked versions of popular snacks, like the Baked Sev, Multi Flour Chakli, Baked Ribbon Sev or Baked Whole Wheat Puris. You can make them in bulk and store in an air-tight container. Relish as and when hunger strikes or carry them in your dabba to munch upon at work. Health conscious people can savor Baked Vada Pav, Baked Samosa with Mixed Sprouts, Matarsutir Kochuri without worrying much about calories. Also, baking is convenient than deep-frying. 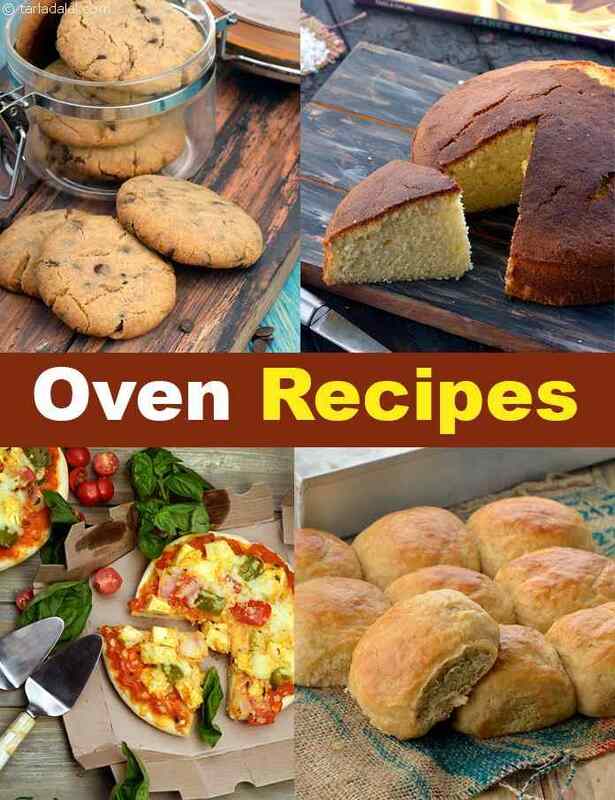 Enjoy our oven oven recipes which span across all categories of baked foods and you will clearly enjoy the pleasure of owning an oven as you keep trying these recipes.